We’d love your help. 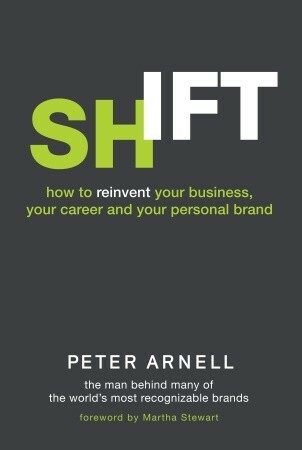 Let us know what’s wrong with this preview of Shift by Peter Arnell. When some of the world’s biggest corporations need to revive their brands, innovate products, and rethink their images, they call Peter Arnell. Now in his fourth decade of branding and marketing for such companies as Samsung, Reebok, DKNY, GNC, and Pepsi, Arnell explains how you can use some of the same strategies that famous bra Little changes can make a big difference. Now in his fourth decade of branding and marketing for such companies as Samsung, Reebok, DKNY, GNC, and Pepsi, Arnell explains how you can use some of the same strategies that famous brands do, in order to improve your own image, life, and career. Arnell knows this firsthand because he applied many of these same strategies to transform his own life by losing 256 pounds. Arnell created an idea he calls Shift. With Shift, you’ll discover the steps you need to take in order to become the best you. Creating and revitalizing brands happens every day in business. Shift shows how you can make it happen for yourself and your personal brand. Innovative insights such as “go helium” are used by Arnell to explain how he reached his ultimate goal of 150 pounds—you can apply his techniques to reach for your own goals. You will see—through Arnell’s description of how he “went tiger”—how to exercise your own discipline and commitment, without apology, even if that means bucking the norm. And by learning to reach out to your brand audience, you will come to understand the importance of your network of friends, acquaintances, colleagues, and family—your fan club— in keeping you motivated and providing the feedback you need for success. Weaving together personal stories of his own transformation with stories about how he created transformative change for brands such as Reebok and Pepsi, Arnell shares his unique vision on how each of us can rebrand and transform ourselves, both personally and professionally, to achieve the success we desire. To ask other readers questions about Shift, please sign up. Peter Arnell is cool; he’ll tell you so. He’s reinvented Samsung, Reebok, Pepsi, DKNY, and scads of other businesses by redrawing their logo or rebranding their image (with some nominal help from other people). He’s also lost 256 pounds seemingly overnight and without a lot of medical insight. And he knows a lot of famous people, and, kids, he’s not afraid to name-drop. That’s about all I got from this book. Arnell is an expert of branding. “Branding” happens when we quit saying cotton swab and s Peter Arnell is cool; he’ll tell you so. He’s reinvented Samsung, Reebok, Pepsi, DKNY, and scads of other businesses by redrawing their logo or rebranding their image (with some nominal help from other people). He’s also lost 256 pounds seemingly overnight and without a lot of medical insight. And he knows a lot of famous people, and, kids, he’s not afraid to name-drop. That’s about all I got from this book. Arnell is an expert of branding. “Branding” happens when we quit saying cotton swab and start calling all brands Q-Tips. We also don’t say tissue; we say Kleenex. Branding is how Marky Mark became Mark Walhberg. It’s also how boring, yuppie Hush Puppies became hip for a couple years there in the late 1980s. “Branding” is also taking a hot poker to a cow, and sometimes I wanted to do that to Arnell, because his book (though thankfully brief) lacks detail, humility, perspective, and step-by-step instructions. In the modern world, branding is important, though, despite my snarkiness about Arnell. We consumers know in an instant the main point or “feel” of a product or a person through imagery and iconography. It’s how we can learn a lot of emotional and logical information in one quick glance. Arnell excels at this; he admits with no sense of modesty. Arnell says he lost 256 pounds by simply eating 50 to 60 oranges every day; his hands are branded orange from the experience. It doesn’t sound super-healthy, but then who am I to argue with the weight loss. He also asked famous chefs to reinvent meals for him, and he had Martha Stewart and famous designers give him wardrobe tips. There is no talk of exercise; there is no information on how long this took him; there are no slip-ups along his path to thinness. There are a couple good tips; he talks about having physical reminders (like his oranges, or a niece’s keyring) to help you reshape yourself. But, really, that could have been covered in a short magazine article. Branding will also help you in business; if you’re a videographer or a ckae decorator or a painter, it’s nice to have your customers instantly tie your name to the work and think of you first. Mostly, though, there is no specific insight or assistance in this book. It’s all touchy-feely and inspirational without any solid directions. Arnell reminds me of an analogy I heard from a professor: “People love to be the front end of the bicycle; they love to steer. But when it comes to the work, they hate to pedal.” In other words, they want to create and design and give suggestions and throw out ideas for improvement. But they don’t want to handle the nitty-gritty, and they sure don’t want to get their orange hands dirty. They want to be artists without all that labor involved! Where to start, where to start... This book might better have been titled "The Marginally Interesting Weight Loss Journey of Peter Arnell." Or better yet "Peter Arnell Toots His Own Horn." Or better still "Peter Arnell Breaks His Own Arm Patting Himself on the Back." This book was narcissistic, rife with name-dropping and self-congratulation, and offered very little in the way of actual advice on the personal re-branding process. It felt like each time Arnell got close to offering something help Where to start, where to start... This book might better have been titled "The Marginally Interesting Weight Loss Journey of Peter Arnell." Or better yet "Peter Arnell Toots His Own Horn." Or better still "Peter Arnell Breaks His Own Arm Patting Himself on the Back." This book was narcissistic, rife with name-dropping and self-congratulation, and offered very little in the way of actual advice on the personal re-branding process. It felt like each time Arnell got close to offering something helpful he veered away into yet another saga of his own brilliance in saving a company's image. "So you want to change your image. You should 'go helium.' Shoot higher than you normally would. For example, there was the time Donna Karan came to me begging for help, and my brilliance launched her - overnight - into fame and fortune." Not an actual quote, but you get the picture. I am constantly digging for some insight or idea that might allow me to become better at some aspect of my life. And, for some reason this book really struck a chord. I'm not sure exactly why this book hit me so hard. It could have been the amount of oranges that Arnell eats. I've been an avid orange eater, eating more than a dozen a day on more occasions than I would care to admit. Or, it could be all of the strategies about branding that I found met my own philosophy on marketing and branding. I am constantly digging for some insight or idea that might allow me to become better at some aspect of my life. And, for some reason this book really struck a chord. I'm not sure exactly why this book hit me so hard. It could have been the amount of oranges that Arnell eats. I've been an avid orange eater, eating more than a dozen a day on more occasions than I would care to admit. Or, it could be all of the strategies about branding that I found met my own philosophy on marketing and branding. Or, it could have been any number of other things. Anyway, I found the strategies that Peter Arnell offer to apply to me. The idea of 'Going Tiger' to be more yourself than you have been allowing yourself makes sense. I think everyone finds themselves getting stressed out because they aren't completely following along with what they think they should be doing. Or, this idea of 'Going Helium' as a way to shoot past easy goals and to dream large...another great idea. This is not a very interesting book. Arnell has a good story of losing weight, but he spends most of the time talking about himself and stories from his career. When he does try to tie it to what the reader can do, it's usually a pretty obvious connection. Why did my one and only father send me this? Either he adored it or, or he simply needed to get rid of it, and make room for superior reading materials. I'm guessing the latter, but let's see. The topic of this book is "how to reinvent your business, your career and your personal brand". Based on the subtitle's description I expected the book to be a strategy with examples how to rebrand. What I read did not meet my expectations of what the title described. Arnell writes a great story about the rebranding of his life, career and brand. He writes in a way that makes it easy for me to connect with him and he seems very approachable and friendly. Most of the book discusses his incredible The topic of this book is "how to reinvent your business, your career and your personal brand". Based on the subtitle's description I expected the book to be a strategy with examples how to rebrand. What I read did not meet my expectations of what the title described. Arnell writes a great story about the rebranding of his life, career and brand. He writes in a way that makes it easy for me to connect with him and he seems very approachable and friendly. Most of the book discusses his incredible weight loss. For that alone, he is an inspiration. He includes stories about his business experiences an how he helped household brands reinvent himself. Most people in the USA culture would know the names of the companies he has served well. 1- It should have been in self help or biography section, not the business section of the library. 2- The subtitle could be retitled to describe how he reinvented his business, career and brand. 3- The stories about how he helped organizations rebrand tell more about what he did, but I would have loved for his cases to describe deeper the why, how and thought process behind the new strategy. 4- Or to keep it in the business section, the author could spend more time laying out a strategy for how others could implement a similar plan in their own life because I think the book focuses more on Arnell's story than the readers' stories. And that's perfectly ok. This is a motivational/autobiography book. The author explain his weight loss journey and motivates to make big changes to achieve a goal. A good marketing book when marketing yourself is your primary goal. The author's engaging narrative of his own personal transformation is central, and works very well to anchor his theory. He also reveals several of his personal mantras which make for good memory devices. The book has two glaring weaknesses, however. 1) His high profile stature makes some of his examples fall flat. Some of them, while describing the stakes, actually undermine his position. One such example is when he talks about A good marketing book when marketing yourself is your primary goal. The author's engaging narrative of his own personal transformation is central, and works very well to anchor his theory. He also reveals several of his personal mantras which make for good memory devices. 1) His high profile stature makes some of his examples fall flat. Some of them, while describing the stakes, actually undermine his position. One such example is when he talks about needing the right person for the campaign, so he hired Celine Dion to sing. Now I am no longer thinking about creativity or simplicity. It sounds more like throwing money at the problem. "Of course! Just sign crazy superstar! Why didn't I think of that?" 2) Even though he has a great theme about vision and his own story of transformation, the book is named "Shift" which seems unrelated to the theme in any direct or metaphorical way. Though I get it, it is the kind of title that needed to be more integrated. This is, of course, ironic since this is a marketing book. When a guy who has reinvented the brands like Samsung, Pepsi and Reebok writes that what he did with those brands can be replicated to develop a personal brand, I say this looks like worth reading. Worth reading it is! Peter Arnell has beautifully converged his personal journey of loosing his weight of over 200 pounds to the world of his experience with brands which have changed our lives in some way. This book certainly provides a priceless opportunity to peek in the mind of the genius and prov When a guy who has reinvented the brands like Samsung, Pepsi and Reebok writes that what he did with those brands can be replicated to develop a personal brand, I say this looks like worth reading. Worth reading it is! Peter Arnell has beautifully converged his personal journey of loosing his weight of over 200 pounds to the world of his experience with brands which have changed our lives in some way. This book certainly provides a priceless opportunity to peek in the mind of the genius and provides an insight of how creativity works. The entire book is written in an autobiographical style, with anecdotes placed in proper places, but then again one cannot expect any less quality when it comes to positioning from Mr. Arnell. Reading his principles is more of a personal journey, if one chooses to follow it in their lives. Great concept but poorly executed. The problem is, this fellow is clearly an ad exec talking about your career the way stereotypical ad execs do--assuming that people are basically stupid and will buy anything branded the right way. I do love his emphasis on discovering your core values and skills rather than trying to create a new, inauthentic "you," but the tone is so condescending that the sage advice is mostly lost. Ps . His weight loss tips are pretty sketch. I can't imagine what the benefit Great concept but poorly executed. The problem is, this fellow is clearly an ad exec talking about your career the way stereotypical ad execs do--assuming that people are basically stupid and will buy anything branded the right way. I do love his emphasis on discovering your core values and skills rather than trying to create a new, inauthentic "you," but the tone is so condescending that the sage advice is mostly lost. I read it, it was okay... The price is out of proportion because the book is so short. For the most part all the author does is keep bringing up the point that he lost so much weight. We get it: you're not fat anymore, now can you talk about anything else without using a metaphor for the weight loss? His point is about changing habits, ahem "shifting" habits. The whole thing is pretty much common sense bits of advice thrown in with him complimenting himself on everything he has done in his life. more of an auto-biography than anything else. there are morsels of interest sprinkled throughout the first half of the book, but it's mostly a self-aggrandizing review of the author's work, life and weight loss. could really have been synthesized as a blog post. Silly little book about a MAN who eats dozens of oranges all day!Saw him on Martha Stewart's show..she recommended reading his book ,of course!I got suckered in.But,Really..this is an important book to read because......?????? Marketing superstar Peter Arnell gives the secrets of rebranding from his own personal story of a complete rebranding of who he was, how he lived, and how he appeared. His achievement adds substance to the corporate illustrations of branding makeovers. A good book about building brands and reinventing yourself. Lots of insider stories as Arnell has worked with many top companies and big names in fashion, etc. I really liked this book. This man has gone through an incredible transformation, both physically and wholistically. I thought he should have spent a little more time talking about personal branding and how that needs to be fleshed out. Overall, quite inspiring. Read Shift while on vacation in Jamaica. Interesting read concerning our perspective and how it can be shifted in order to help us realize our goals. Too self centered. It's more biography than business book. Whatever little weight Martha's endorsements held is now nonexistent.